The arborvitae tree is actually a very big low-maintenance shrub that can be used as a large hedge or accent. The soft, dense foliage is a brilliant deep-green, which stands out against other greens in the yard. Naturally teardrop or globe-shaped, this plant needs no trimming to keep its symmetrical form. The name arborvitae means "tree of life." The bark and foliage contain Vitamin C, which can be made into a tea. But what it does need is space...and lots of it. Many arborvitaes take on a less attractive vase shape from being trimmed - usually because the homeowner made the mistake of planting too close to the house, walk, drive or road. Sure, it's cute and little to begin with - but you must give this plant plenty of room. 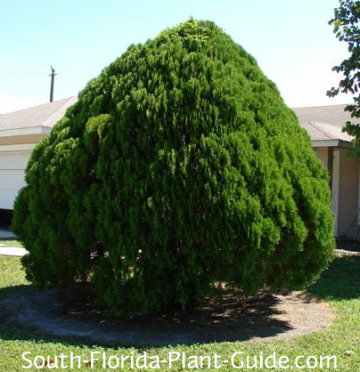 A mature arborvitae can spread out as much as 20 feet. These plants look fabulous lining a property line or large drive, or as single specimen trees in formal landscapes. 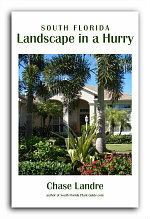 As landscape trees, however, they tend to lose their good looks with advanced age (something we can relate to). 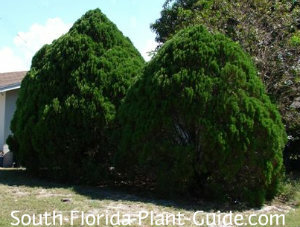 These are evergreen moderate to fast growers that can reach 40 feet tall by 15 feet (or more) wide. Arborvitae is cold hardy, preferring the temps of Zone 9B and cooler areas of Zone 10A. Full sun and plenty of space is required. Arborvitaes are drought-tolerant once established. No trimming is necessary. These plants have a naturally beautiful shape that shouldn't be messed with. As the plant matures, however, you may decide to remove lower branches to create more of a shade tree look and use. These plants need a well-drained location. They do best with regular irrigation that allows enough time for the soil to dry out between waterings. Place an arbovitae at least 8 feet - more, if possible - from the house, drive, and anything else. Too close and it will overgrow its space. 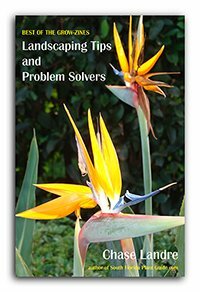 When planting in rows to form a hedge or privacy screen, place each plant about 6 feet from the next. If planting along the property line, come in about 8 feet. Avoid placing things around the base, since the plant's growth will overtake anything too near. 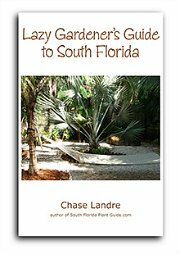 COMPANION PLANT SUGGESTIONS: Nearby plants might include Japanese boxwood, copper plant, Maui ixora, orange bird of paradise, king sago palm, bush allamanda, and liriope.